Our company has years of experience on drilling holes for underground maintenance tunnels, manholes and road drainage systems. Additionally, we offer core drills for ventilation systems for steam pipes and run-off, including sewer piping and grating. They can make installing pool fencing and handrails a breeze. It can also be used to access power lines and phone cables, vents, anchors, pipes or conduit. Each member of our team has extensive knowledge and experience to ensure you receive top-quality work for all of your projects. 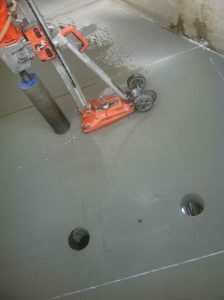 Coring is used to make holes in solid concrete without damaging the concrete. It can also be used to penetrate holes in walls for light switches and outlets and can be used to make ceiling holes to install light fixtures. 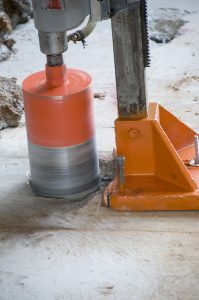 The drill removes a cylinder or core shape from solid concrete. The machine allows us to remove the concrete core to create a space you need. This core can then either be preserved, broken down and reused or removed from your worksite and disposed of properly. The diameter of the whole can range from 15mm fine holes to 300mm large holes. The diameter of the hole will depend on your particular needs. We use diamond core drill bits to ensure a clean, perfect finish. These drill bits perform wonderfully and do not cause damage to any surrounding areas. We use a wet drill process to prevent dust and reduce the amount of noise created. Note: It should only be performed by a specialist and is not considered a do-it-yourself project. Core jobs require that the edges be rounded off or beveled. By using the correct drilling tool, we can ensure that the hole is created right the first time. Plumbers and electricians often carry core drills in their toolbox, which allow them to drill into concrete floors and walls. Larger hydraulic or electrical core drills should only be used by a concrete specialist. Concrete drill bits cut a circular hole in the concrete and allow the core to be removed as a “whole” rather than pulverizing the concrete. This drill bit design allows holes to be neatly cut without creating a large mess. Finally, drill bits come in a variety of sizes to ensure the hole drilled is the perfect size.